When it comes to premium convertibles, few can hold a candle to the Mercedes CLK. Beautifully built, extremely elegant and possessed of some of the best engines in series production, it's everything a high end four-seater drop top should be. As you would expect, demand is sky high, so be prepared to bide your time if you're looking for a used bargain. The original CLK Cabriolet rapidly established itself as a car a cut above BMW's ubiquitous 3 Series Convertible in the drop top pecking order, its market position helped by the fact that neither BMW nor Audi built open-topped versions of their 5 Series or A6 models. The second generation car debuted in 2003 and shortly thereafter the CLK line up was re-jigged significantly. The CLK280 replaced the rather unloved CLK240, while a new CLK350 variant slotted in just below the CLK500 version. Somewhat curiously, Mercedes has never offered a diesel engine in the CLK Cabriolet (although they did in Europe), a strange decision given the diesel's success in the CLK coupe and the quality of engines in the marque's portfolio. In Summer 2005, the car adopted what Mercedes dubbed 'Direct Control' technology. This amounted to modified axle bearings, more direct steering and a shorter gearshift travel, offering a sportier, more dynamic feel to the car. Likewise, optional steering wheel gearshift buttons for models with an automatic transmission, revised audio units with Europe-wide navigation and bi-xenon headlamps with cornering light function were also introduced. Thanks to the seven-speed automatic transmission 7G-TRONIC (the first of its kind in the world), the fuel consumption of the CLK 500 was reduced significantly at crusing speeds. Stung by criticism of so-so interior quality, Mercedes also took steps to redesign many of the CLK's switches and controls. Trim changes included a redesigned front bumper and radiator, plus a smarter fascia for Avantgarde-trimmed models. In Summer 2006, a flagship 481bhp CLK 63AMG flagship variant was introduced with a 6.3-litre V8 putting the previous CLK 55AMG flagship in the shade. The CLK200K model was upgraded from 163 to 184bhp later that year. 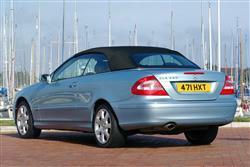 So what do you get if you opt for the Cabriolet over a more conventional hard topped CLK? The hood itself was available in black, blue or grey and is probably the most sophisticated soft top around. No manual intervention is required and the whole process operates in a matter of seconds, the multi-layered hood vanishing beneath a flush cover at the back. Considerable work has gone into reducing the width of the rear hood pillars that has traditionally made reversing a soft top with the hood up a fingers crossed operation. The hood also offers class leading thermal insulation and noise absorption qualities. What's more, it can all be operated by remote control from your key fob as you approach your vehicle. The boot lid can also be opened by remote control and offers a cavernous 390-litre capacity, making the CLK Cabriolet a genuine touring car. This 40-litre increase over the preceding model reflects the fact that despite its trim styling, this CLK Cabriolet is a larger car than its predecessor. Headroom, elbowroom and knee room for all occupants was also usefully increased. As with any Mercedes, safety was given top priority. An array of sensors control the hidden rollover bars which can pop up to protect rear seat occupants in a fraction of a second should a catastrophic accident occur. There are also large head and thorax airbags in the front seat backrests while side bags for rear seat occupants are available upon request. Automatic belt feeders for the front seat occupants were fitted as standard and a sensor calculates the weight of the front passenger in order to tailor the deployment of the airbag. Other standard equipment included automatic climate control with rear seat outlets, rain sensing wipers, cruise control, a multifunction steering wheel and self-levelling headlights. Two trim levels were offered, as with the Coupe version (Elegance and Avantgarde). As ever, a dizzying array of high-tech options were available, including Keyless-Go, the COMAND APS navigation and audio system, the Linguatronic voice recognition system and the Distronic proximity sensing cruise control. Very little goes wrong. Don't pay unrealistic prices, look out for cars that have been unreasonably thrashed, check for signs of accident and hood damage. Obviously, insist on a proper authorised dealer service history. With Mercedes offering a generous four-year support package and virtually lifetime cover, a proper service record is important. On the move, the absence of that centre window pillar on the MK2 model makes more difference than you would credit, allowing a fresh air experience akin to that of a convertible with few of the drawbacks. Expect to also find far superior levels of ride and handling, aided by much greater feel and sensitivity from the revised power steering system. The V8 models have over 300bhp to play with, the CLK 500 with 302bhp and the CLK 55 AMG boasting 362bhp. The AMG models feature composite brakes and get a sportier exhaust with twin tailpipes. In the CLK 500, you can console yourself when signing the cheque by remembering that the revolutionary 7G-Tronic automatic gearbox fitted to this model has helped economy and improved performance. This car will jet to 60mph in just 5.7 seconds. You can also amaze friends with two reverse gears. Further down the range, even the more affordable models are well worthwhile. The CLK 200K and the CLK 280 both have much to recommend them. The CLK 200K features a 163bhp 1.8-litre supercharged unit that Stuttgart says has all the economy of a four cylinder engine with the refinement of a 'six'. It's certainly quick enough, with sixty 9.3s away en route to 143mph, yet at the same time the potential for a 33mpg Euro-average. The CLK 280's 231bhp 3.0-litre V6 unit meanwhile, is so smooth and torquey that it seems rather pointless to cough up for the 272bhp CLK 350 variant. The CLK Cabriolet is a lot of car that costs a lot of money. If you're looking for the most elegant drop top in its class, look no further. If you're on a slightly more limited budget, the CLK200K is a decent bet. Those shopping for a nearly new car that's already had a fair bit of the depreciation curve lopped off would do well to check out a CLK350. One thing's for sure: unless you're expecting razor sharp handling, the CLK Cabriolet shouldn't disappoint.